It's the end of an era: Sony has announced that it will be halting Japanese sales of the venerable 3.5" floppy diskette, signaling the end of the once-ubiquitous storage medium. The 3.5-inch floppy diskette was a revolution when it debuted in 1981, offering smaller size, greater capacity and far more toughness than its 5.25-inch predecessor. The original double-density diskettes could hold up to 720 kilobytes of data, while the high-density diskettes that followed a few years later were capable of storing a whopping 1.44 megabytes each! 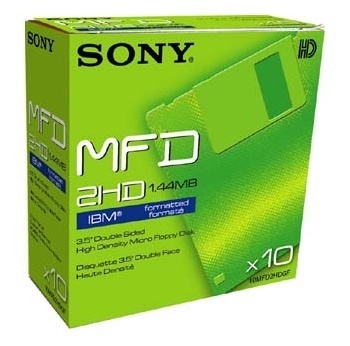 It was heady stuff back in the day but in the current era it's not even enough to hold a single medium-resolution image, and so it is that Sony is finally pulling the plug on the once-great floppy. The company has already discontinued sales to most overseas regions and with 70 percent of the Japanese market under its control, when Sony says it's over, it's over. Sales of Sony diskettes in Japan will come to a close in March 2011. My own floppy diskette era ended a couple years ago, when I finally moved to a PC that didn't have a 3.5" drive in it. Prior to that I'd insisted on having one strictly as a matter of tradition, although I couldn't even hazard a guess as to the last time I actually used one. Even now when I look at my PC, with its dual-layer DVD drive, various flash memory slots and USB ports, I sometimes feel as though something's missing. I still keep a good hole-punch handy, though; I guess I'm just an old softie at heart.